allu62 - Welcome to the Forum! If you upload a screenshot of your Base in Base Editor Mode to a image Server like imgur.com you can post here and we can better advise you. Last edited by DeathStriker on Mon Aug 27, 2018 3:28 pm, edited 1 time in total. Copy BB Code to post here. allu62 - as a Level 5 you will see Heroic Defense "events". My first recommendation is that you consider changing your Base to a North (Up) Corner Base Design with most of your Walls along the Sourthern (Down) edge of your "core base". This will help in future HD "events"
I would start by placing your SC up in the top corner so that the "trigger range" barely overlaps the "edge" and then build around that. Once you change your Base just repost here using the instructions found above. MOST IMPORTANT: Look at "trigger" Ranges for SC, Turrets, and Traps. Don't waste "Ranges" by placing Structures that have them right next to Edge... move these so the "trigger range" just overlaps the Edge so as to not waste "defensive protection" and to provide better protection of your Base. Move WALLS from Northeast (Up-Right)/ Northwest (Up-Left) to the Southeast / Southwest area. You should try to have 2 solid Walls that are separated by 1 grid space. Move HQ, SC, Hero Command, and Starship Command to North (Up) Corner. **Place SC so Trigger Range just overlaps Northeast / Northwest edge. Place most of your Turrets to the Southeast / Southwest edge behind the double solid wall (see 2a above). Place "other" Structures in front of double Wall or as needed to expand the "Non-Deployment" zone as much as possible. 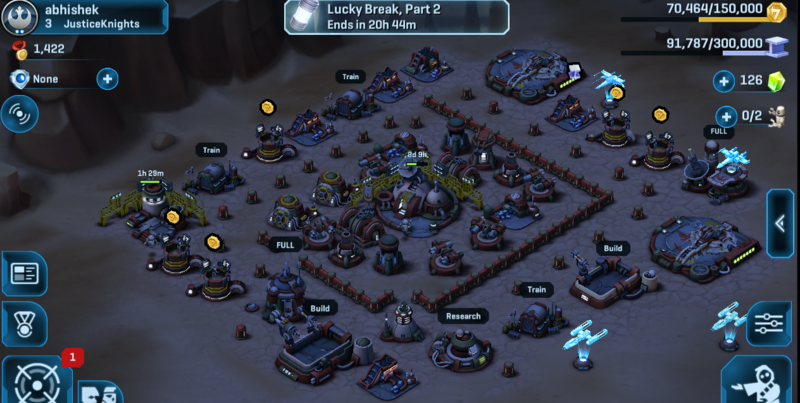 Prep your Base for Level 6 where you get Armory by placing now your Barracks and Factories under shields in your Main Base Core. Lastly... don't forget to put some "bait" Structures like Droid Hut in the Southeast Corner, Northwest Corner and South (Down) Corner.